inplant training in coimbatore for all department students. Best inplant training in coimbatore company with Free Workshop and Free Corporate Training Test. We offer best inplant training in coimbatore for cse department students in web development using html, css, php and mysql database connectivity with queries. We offer best inplant training in coimbatore for it department students in web development using html, css, php and mysql database connectivity with queries. We offer best inplant training in coimbatore for ece department students in embedded systems using Arduino IDE micro controller and sensors. We offer best inplant training in coimbatore for eee department students in embedded systems using Arduino IDE micro controller and multiple sensors. We offer best inplant training in coimbatore for eie department students in embedded systems using Arduino IDE micro controller and multiple sensors. We offer best inplant training in coimbatore for ice department students in embedded systems using Arduino IDE micro controller and multiple sensors. We offer best inplant training in coimbatore for civil department students in using CAD, CMI Tools, hardwares and Software basics for designing works with practical project exposure. We offer best inplant training in coimbatore for mechanical department students in Mechanical CAD courses, Advanced Mechanical CAE courses using designing. We offer best inplant training in coimbatore for biomedical department students in embedded systems using Arduino IDE micro controller and sensors. 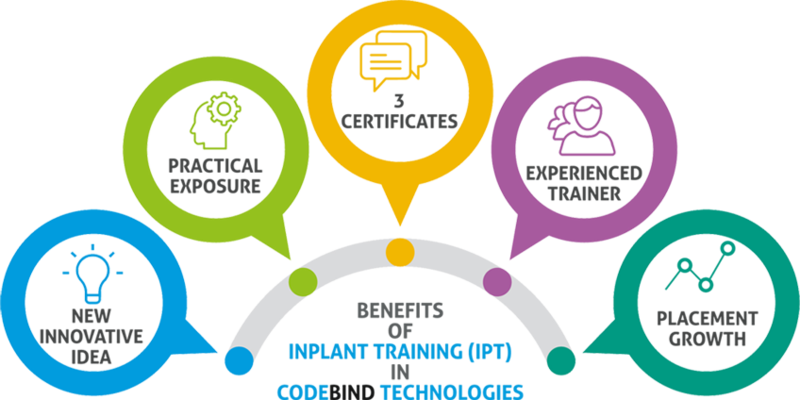 CodeBind Technologies is ensuring to full fill your expectation than providing real time inplant training in coimbatore to all engineering streams. However, every engineering student should attend the training to build the career in their relevant field. The day starts with your own innovative thoughts in making new things. There is popular saying: “you can’t just keep what works are onetime done, everything around you is changing. to succeed stay out in front of change”. The inplant training is the best way to succeeding in your career, so now your changes are making with us! Inplant Training(IPT) in Coimbatore is to bring you out from theoretical to practical mode with actual content. Being a student, it’s a first training step to know how to move in to employment or commercial market. Instead of an example or assumption, Inplant training will provide the real time experience to have solution. It’s a place to prepare yourself to be ready to face and break the barriers to achieve the goal. Inplant training will teach you to listen, calculate, structure, schedule and to plan from the third party. To understand the difference from students culture to working culture and friends to colleagues. Inplant training will make you to remove your blur & nervous and be a cool and casual candidate for an interview. This is an opportunity for you to build your confident level to be more proud and choose the right entry. This IPT will provide you oral and written communication skills to liaise with your superiors in an office situation. A student should not miss the inplant training choice to have hands on experience which required for your carrier.